“I’m not allowed for security reasons to have an iPhone,” U.S. President Barack Obama told a group of young people at the White House for an event promoting his health care law. 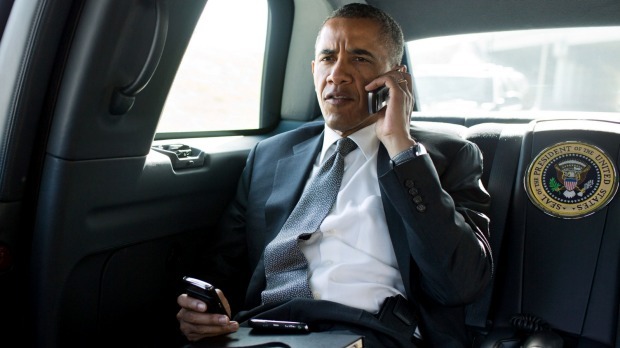 He added that his daughters Sasha and Malia spend a lot of time on their iPhones. Blackberry is renowned for its strong security encryption — one reason why it is still popular in official Washington, even as the device loses market share to other smartphones including those manufactured by Apple. Apple was one of several tech companies that may have allowed the National Security Agency (NSA) direct access to servers containing customer data, according to revelations by former NSA contractor Edward Snowden. The companies deny the allegation. Obama fought to keep his BlackBerry after coming to the White House in 2009, though he said only 10 people have his personal email address. Neither George W. Bush nor Bill Clinton used email during their presidencies. BlackBerry virtually invented the idea of on-the-go email, but lost its market stranglehold as rivals brought out more consumer-friendly devices, like Apple’s iPhone and phones using Google’s Android software.